First Prize Dive, under champion jockey Cody Jensen, setting the fastest qualifying time for the Black Gold Futurity Championship Saturday afternoon at Will Rogers Downs. CLAREMORE, OK�OCTOBER 25, 2014�First Prize Dive and Pyc Prize Time, a pair of two-year-olds sired by full brothers IVORY JAMES and Pyc Paint Your Wagon and out of full-sisters First Prize Pearl and First Prize Fancy, posted the two qualifying spots for the $318,217 Black Gold Futurity Championship(RG3) on Saturday afternoon at Will Rogers Downs. The 10 fastest qualifiers, from the three trial races, will return to the Northeastern Oklahoma racetrack on Saturday, November 8th and vie for the winner's share of the purse contested at 440 yards. Seventh in the RG2 $171,650 Speedhorse Gold & Silver Futurity just two races back, First Prize Dive was a game � length winner over Clouds A Dancin in the final trial. Ridden by AQHA Racing Champion jockey Cody Jensen, the son of IVORY JAMES completed his task in a sharp :21.337, earning a 110 speed index with no wind. Brandon Reed conditions the bay gelding owned by Looking For Gold Racing. It was the third win in nine starts this season for the $23,153 earner. Weetona Stanley bred First Prize Dive from the Mr Jess Perry mare First Prize Pearl, a daughter of former Broodmare of the Year First Prize Dash. 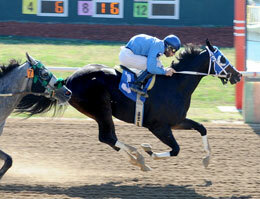 Reed also saddled Pyc Prize Time to one-length win over Black Gold 400 Futurity winner Cartel Rosie in the first trial. Ridden by Agustin Silva, the bay colt covered the 440 yards in :21.456, a 109 speed index. Steven Wilson owns the two-time winner from six starts this season. Weetona Stanley and William Smith bred Pyc Prize Time from First Prize Pearl, also a Mr Jess Perry daughter from the aforementioned First Prize Dash, by Dash For Cash. Pyc Prize Time is also a brother to 2014 Remington Park Futurity(RG3) winner Im A Fancy Pyc who won five of six starts this season and earned $454,765. For the complete list of Black Gold Futurity Championship qualifiers, times, sires, dams, owners, breeders, trainers and jockeys CLICK HERE.